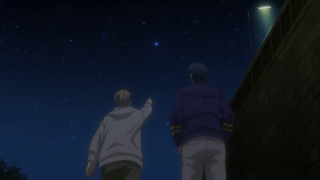 Episode 09, "Each Person's Star"
Synopsis: On Heinessen, the High Council of the Free Planets Alliance debates the pros and cons of launching an offensive into Imperial territory. The majority, reacting to their sagging poll numbers, approve, as a military victory will bolster voters' opinions. Meanwhile, Yang Wenli's letter of resignation is turned down on the basis of the need for competent officers and the possibility of the 13th Fleet breaking down. 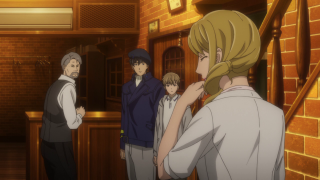 Yang and Julian have dinner with Frederica and her father, Admiral Dwight Greenhill, who discuss Julian's accolades in school and the general political mood. On their way home, Yang discovers Jessica Edwards has been elected for political office on an anti-war platform. On the planet Phezzan, Adrian Rubinsky manipulates the economies of the two warring nations. This episode adapts the second half of Chapter 6 from the first novel, and adapts it pretty dead one, aside from some additional scenes of Jessica Edwards. Even the break down on the road and the police officer offering to assist Yang is directly from the book. 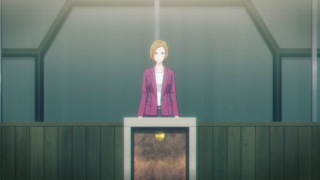 However, in the original animated version of this material, the OVA, Jessica Edwards' political life gets its own episode, where at first she's just helping an anti-war candidate win an election before he's killed by a pro-war faction and then runs herself, winning. Here, it's kind of the bookends to the various goings on in the FPA as the country marches closer to another offensive. 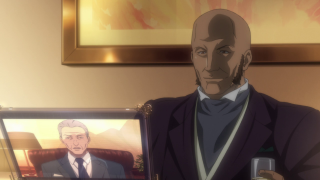 One thing I noticed is that unlike in the OVA, where the character designs of the High Council are fairly distinct (with Trunicht properly slimy-looking and Cornelia Windsor cold and pale), most of the council members here kind of blend in. 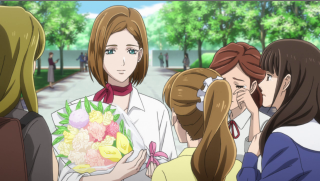 I suppose it could be in an effort to make them seem less important, but if there's one character here with an ostentatious design, it's Cornelia Windsor, who has a hair style resembling the OVA's design for Jessica Edwards. Sort of strange (ironic?) that she should then be the most outspoken in support for military action. Speaking of the politics in this episode, most of the episode's meat isn't in Yang's reaction to being turned down for retirement or his hopes for Julian's future, but in the debate between the council members on the subject of using Iserlohn as a bridgehead for an invasion of the Galactic Empire. 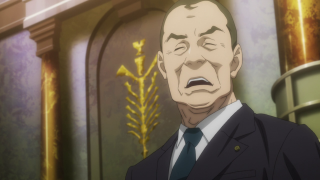 We see politicians drunk on the cheap thrill of sudden opportunity, that being Yang's taking of Iserlohn. Instead of using this as a chance to sue for peace with the Empire while they have the Iserlohn Corridor, they use Yang's success as a springboard into an even greater victory, ignoring pleas about spending and human resources. Windsor is high on the righteousness of defeating despots, and the Council chair wants to ensure his political position, and most of them have no concept of the human cost. As for Trunicht's surprising vote against the measure, you'll see how calculated and clever he is in the future. But the politics in LoGH are still incredibly relevant today, when politicians have become so obsessed with "defeating" terrorism, shallow patriotism showmanship, and dismissing diplomacy in favor of military action. You could have placed this in 2003 in the United States, or even today, regarding Syria or North Korea. And it cuts across both sides of the American political spectrum (the far right-wing and the moderately right-wing). Notice how even the "better" politicians in this argue more out of a need for keeping things working within the FPA than out of a genuine desire for peace between the superpowers. Not to say that their arguments aren't valid, but they're hardly Jessica Edwards. 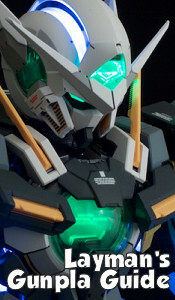 And in the meantime on Phezzan, the Black Fox works to control the two nations by economics, letting them spend and invest more and more in Phezzan-led ventures for the sake of their military victories, so they will stay economically dependent on the domain. Neither women or alcohol can sate Rubinsky quite like his manipulations. It can be a little difficult to believe one man could so easily play both sides without somebody on either noticing the pattern, but militaristic societies often see what they want to, as long as it excuses their excesses. The past few episodes have been excellent and I hope they can continue this quality until the end, though I'm concerned if they'll be able to finish the first book in the last few episodes. However it goes, the next episode should introduce Andrew Falk (sometimes spelled Fork) and Lassalle Lobos, two less unpleasant officers I cannot recall. The invasion of Imperial Territory is about to take off!